Giving to others is part of the holiday season, but there’s an added element of sincerity that comes from a homemade present. If you think these types of gifts are only for the crafty type, put down your tangled mess of Christmas lights and think again. Treat-in-a-jar gifts are simple, easy to assemble, and, most of all, delicious! Whether you need a gift or a stocking stuffer, spread good tidings of joy with these sweet and savory Aprons recipes — plus a bonus treat for your furry friends. Don’t forget to include the kids or bake your treats with friends! After all, togetherness is what the holidays are all about. 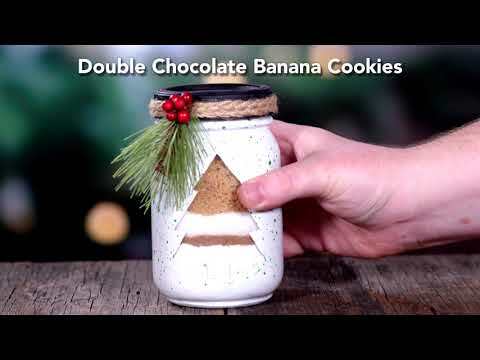 Bring joy to someone who is just as sweet as these Aprons Better Choice Double Chocolate Banana Cookies. Simply layer your dry ingredients, and you have the base for a special treat. If you have frosty feelings about your decorating skills, just tie the recipe card to the lid with a ribbon, and you’re ready to spread some cheer! For the savory lovers in your life, this Aprons Better Choice Beefy Five-Bean Soup recipe will be a welcome change from the holiday sugar rush. The recipient needs very few additional ingredients to warm up even the coldest of winter days! For a more custom look, mason jars can be painted or decorated with other crafting supplies. If you’re getting decorating help from a little elf, make sure the jar is completely dry before adding the ingredients. Many of your favorite recipes can easily be turned into jar gifts. For the chocolate lovers in your life, these decadent Aprons Chocolate Truffle Bars will hit the spot. This recipe promises to be a big hit at busy holiday parties and for quiet Sunday afternoons at home. Once you layer the dry ingredients in the jar, create a recipe card to note the additional ingredients and cooking instructions. When finished, tie a few holly leaves around the jar — or, if you’re daring, mistletoe! Don’t leave the pets out this holiday season! Give the dog lovers in your life a jar filled with tasty treats for their furry friends. Fill a mason jar with several varieties of Publix brand dog treats and decorate as desired. Create a homemade card to let the recipient know which dog treats you included. They may find a new favorite!